The Spiny-tailed Monitor or Ridge-tailed Monitor (Varanus acanthurus) is a small species of monitor lizard. They are native to Northwestern Australia and live in a variety of habitats from arid to tropical regions. Spiny-tailed Monitors are usually a reddish brown with yellow markings but color and pattern can vary with geographic origin. A distinctive feature is their thick spined tail – hence their common name. This tail is used for both attacking prey and for protection from predators. When attacking prey the tail is used like a whip, stunning the prey item which is then consumed without expending further effort. When used in defense, the Ridge-tail will scramble into loose rocks or boulders and use its tail to wedge itself in tight. The spikes give the tail good grip on the rocks, making extraction by other predators nearly impossible. In the species’ home territory, the tail is often found discarded near Ridge-tail carcasses, indicating that predators of this species consider the tail inedible. 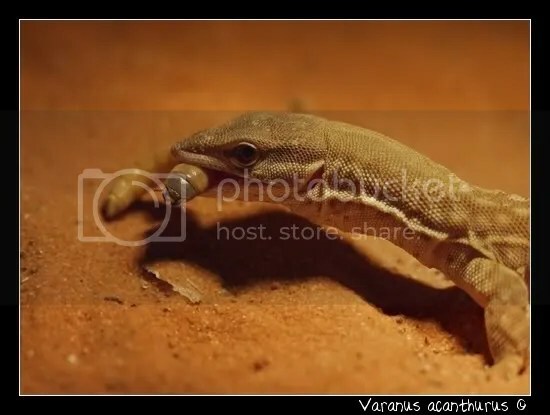 Feeding varanus acanthurus isn’t a hard task. The only thing ‘hard’ about it is being thorough. All monitors need a varied diet, and ackies are no exception. Because of their small size, a mostly-insect diet (the correct diet) is highly feasible. Here, we’ll discuss several possibilities for an ackie diet. Crickets – By far the most popular insect food item. They are easily and cheaply obtainable, and make a great staple food item. Also, they can provide a good source of exercise for the lizards, as well as entertainment for the owner. Mealworms – Another ideal source of food. Mealworms are small and easily stored. An excellent ‘treat’. Cockroaches – Though more expensive than the previously mentioned food items, these are excellent food for monitors. An added plus, is that if you invest in a small colony, and keep them right you’ll have babies in no time, perfect size for ackies. Pinkies – A classic choice for medium to small sized lizards… however it isn’t a good choice. Pinky mice and rats are very high in fat, and not too high in nutrients. They are the equivalent of a stick of butter for us. Real high fat, but not a lot of roughage. A horrible staple, but they make a good treat.